Friday August 5th 1892 I cut out two shirts for Will and worked on them all day. Fanny came and took Mother to town for the day. Will was working about the place all day. It was dark when Mother got home. 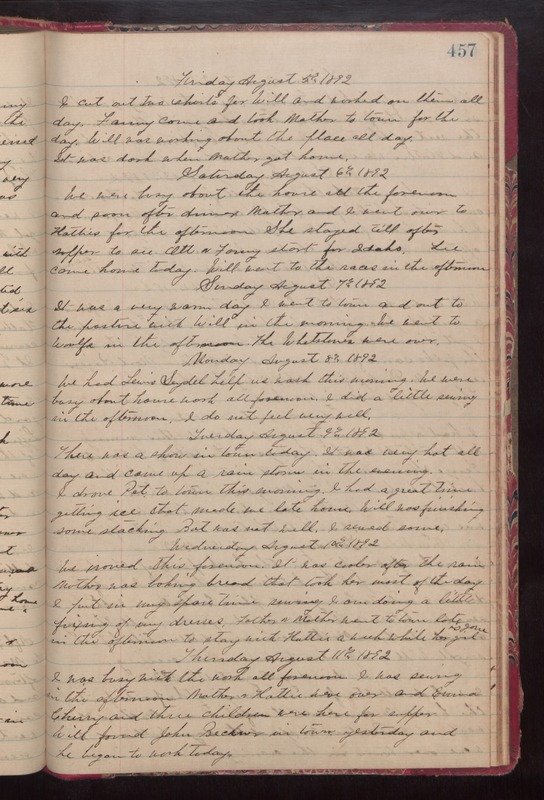 Saturday August 6th 1892 We were busy about the house all the forenoon and soon after dinner Mother and I went over to Hatties for the afternoon. She stayed till after supper to see Ott & Fanny start for Idaho. Lee came home today. Will went to the races in the afternoon. Sunday August 7th 1892 It was a very warm day. I went to town and out to the pasture with Will in the morning. We went to Woolfs in the afternoon. The Whetstones were over. Monday August 8th 1892 We had Lewis Seydell help us wash this morning. We were busy about house work all forenoon. I did a little sewing in the afternoon. I did not feel very well. Tuesday August 9th 1892 There was a show in town today. It was very hot all day and came up a rain storm in the evening. I drove Pet to town this morning. I had a great time getting ice that made me late home. Will was finishing some stacking. But was not well. I sewed some. Wednesday August 10th 1892 We ironed this forenoon. It was cooler after the rain. Mother was baking bread that took her most of the day. I put in my spare time sewing. I am doing a little fixing of my dresses. Father & Mother went to town late in the afternoon to stay with Hattie a week while her girl is gone. Thursday August 11th 1892 I was busy with the work all forenoon. I was sewing in the afternoon. Mother & Hattie were over and Emma Cherry and three children were here for supper. Will found John [Becker?] in town yesterday and he began to work today.